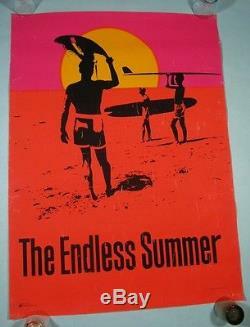 Vintage The ENDLESS SUMMER DayGlo Poster Original 1966 BRUCE BROWN Surf Movie NR. 29 1/4 wide, 40 tall. Original 1966 Dayglo silkscreen poster. >From Bruce Browns classic surf documentary The Endless Summer. Marked at lower left Personality Posters Inc.
74 Fifth Avenue, New York, NY 10001. Last two photos show poster under black light. 1 1/2 tear at right side. 1 tear at top right. Poster has wrinkles as seen mainly to the black silhouettes and the letters. Last two photos taken under black light. Follow us on Instagram: acidstampauctions. Please don't ask us to do so. International Buyers - Please Note. However we are not able to hold your items to be combined with future winnings. We are located in Omaha, Nebraska. We offer a 100% satisfaction guarantee on every item we sell. WE ALSO SELL ON CONSIGNMENT. Our rates vary according to the quality and quantity of your items. Powered by SixBit's eCommerce Solution. The item "Vintage The ENDLESS SUMMER DayGlo Poster Original 1966 BRUCE BROWN Surf Movie NR" is in sale since Friday, September 02, 2016. This item is in the category "Entertainment Memorabilia\Movie Memorabilia\Posters\Originals-United States\1960-69". The seller is "acidstamp" and is located in Omaha, Nebraska. This item can be shipped worldwide. Size: 29 1/4" x 40"